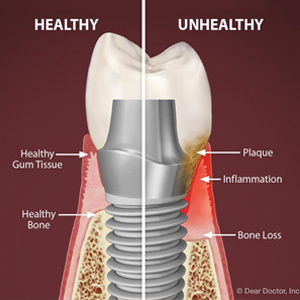 If you have lost one or more teeth to decay, accident or gum disease, you can access today's best tooth replacement option: the dental implant. At Harris Parkway Dental Care in Fort Worth, Dr. Brad McConnell places and restores dental implants, remaking smile aesthetics, preserving gum tissue and bone and giving patients their functional, beautiful smiles back. Learn all the benefits of implants and consider a personalized consultation with Dr. McConnell. Used for more than 50 years, dental implants in Fort Worth and around the globe have proved to be the most successful tooth replacements available. The single-tooth implant has a titanium screw as its foundation (it's essentially an artificial root); it resides right in the jaw below the gums. After this screw and bone bond (this is called osseointegration), the implant can accept the substantial pressures of biting and chewing. 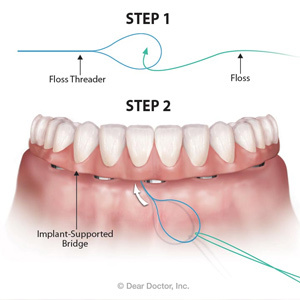 Placed during a brief oral surgery at Harris Parkway Dental Care, a dental implant, or implants if you are anchoring a denture or bridge, is readily accepted by most patients who are healthy and have enough bone in their jaws. Sutures close the site and after several weeks, the dentist bonds on a metal post and porcelain crown. Both the treatment strategy and the procedure itself are simple and highly successful. Most implant procedures work well--to the tune of a 97 percent success rate, says the Institute for Dental Implant Awareness. Dr. McConnell will determine your candidacy with a complete oral examination, X-rays, modern three-dimensional scans and review of your medical history. If you are in good overall health and have sufficient jaw bone strength, you can get dental implants. Have you heard people complain about their traditional dentures or bridgework? Poor speech, sore spots, problems eating, and frequent adjustments and replacements make these old-fashioned prosthetics less favorable choices by far. Dr. Brad McConnell and his team will tell you all about dental implants. Come to Harris Parkway Dental Care for a consultation. Call for a convenient appointment in Fort Worth, TX, at (817) 423-2223, and look forward to a strong, natural-looking smile.